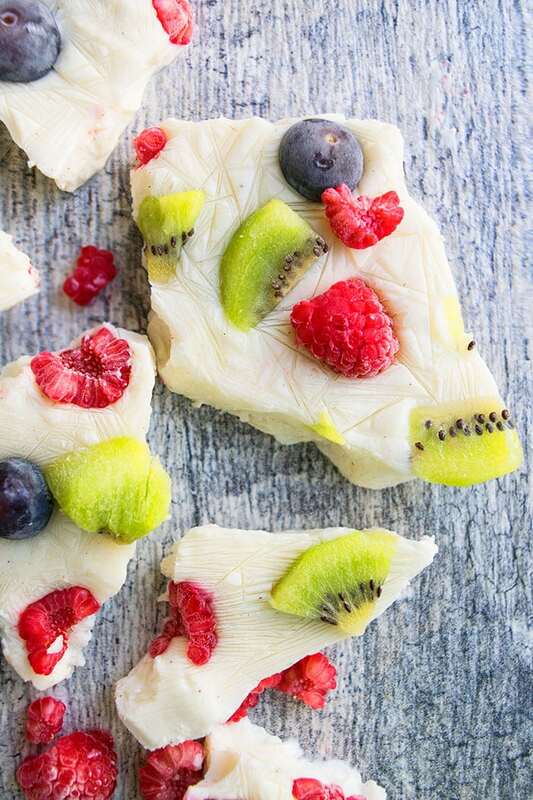 Quick and easy frozen yogurt bark recipe, made with simple ingredients. 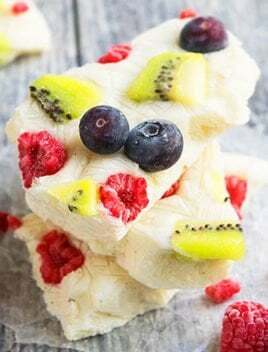 This is a creamy, healthy dessert or snack that’s loaded with fruits (blueberries, raspberries, kiwis), chocolate chips and nuts. 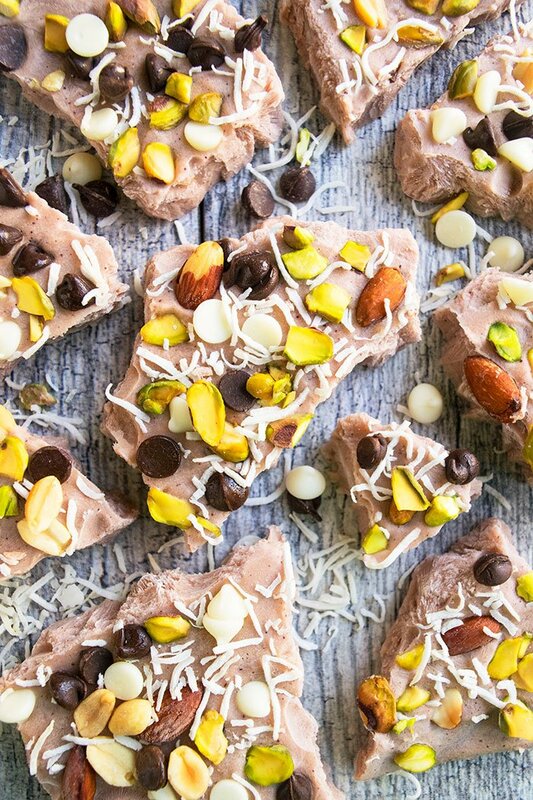 This Greek yogurt bark recipe is so CREAMY and delicious and a absolutely guilt-free! They are fun and colorful and kids and adults can both enjoy them plus they are a very refreshing Summer treat. I made TWO flavors: chocolate with nuts and vanilla with fruits. They were both INCREDIBLE and I really can’t pick a favorite. 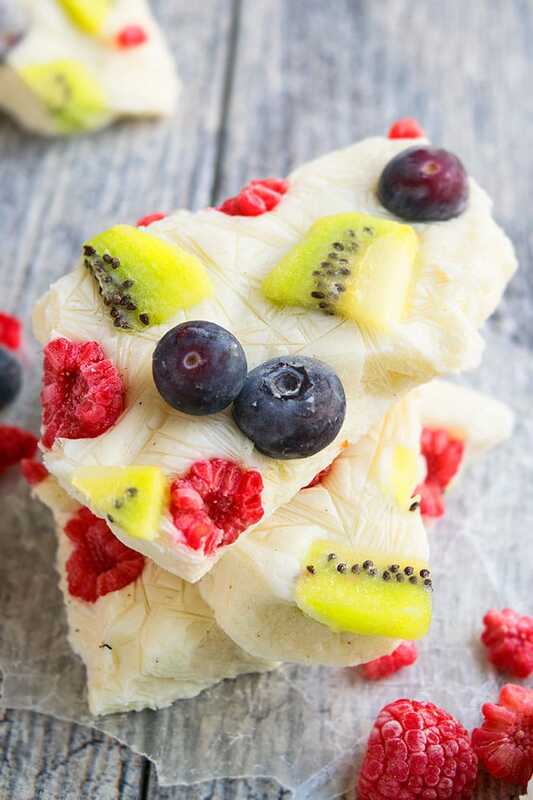 Frozen yogurt bark is a HEALTHY snack or dessert! You can make a batch and freeze it and enjoy it whenever you experience those uncontrollable sweet CRAVINGS. It’s a bark that’s made with thick yogurt (preferably Greek yogurt) that’s topped off with nuts or fresh fruits (mostly berries). Then, it’s frozen until it becomes firm and broken into chunks and enjoyed as a snack. How to Make Yogurt Bark? Spread yogurt on a cookie tray, lined with wax paper. Toss your toppings likes nuts or berries on top. Freeze until it becomes firm. Break the bark into small pieces and enjoy. Yogurt bark with regular yogurt is not super creamy! I have used both, Greek and regular yogurt and I found that Greek yogurt barks are richer and creamier than the regular yogurt barks. However, if you strain regular yogurt through a cheesecloth and get rid of excess liquid and use that in this recipe, it works just as well as Greek yogurt. Strawberry yogurt bark– Use strawberry flavored yogurt OR toss some fresh strawberries on top of the yogurt OR swirl some strawberry jam/preserves on top of the yogurt. Pumpkin yogurt bark– Use pumpkin flavored Greek yogurt and also toss some pumpkin chocolate chips on top. Blueberry yogurt bark– Use blueberry flavored yogurt OR toss some fresh blueberries on top of the yogurt OR swirl some blueberry jam/ preserves OR do a combination of all those ideas. 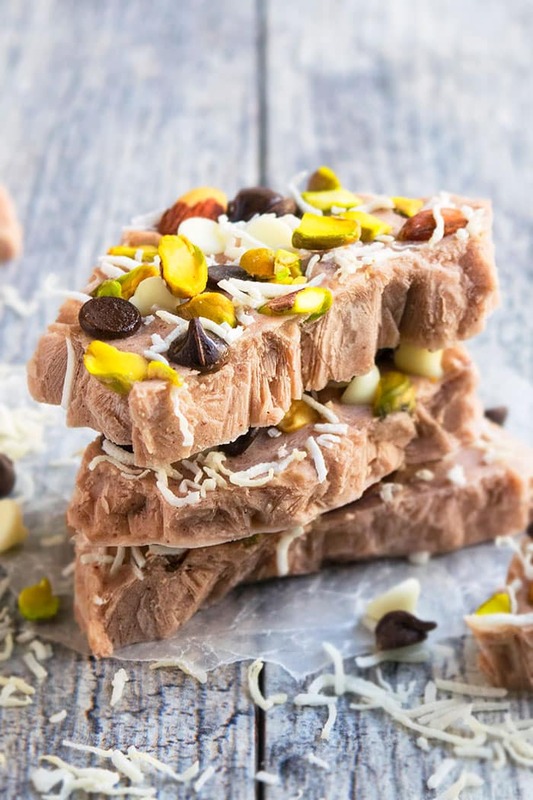 Chocolate frozen yogurt bark– Use chocolate flavored yogurt OR mix some cocoa powder/ chocolate protein powder in the yogurt OR toss some chocolate chips/ chopped candy bars on top of the yogurt OR do a combination of all those ideas. Top it off with nuts– Always use roasted nuts for a deeper flavor. Top it off with fresh fruits– Use whatever fruits are in season. Berries seem to be a very popular choice. Top it off with jams, jelly or preserves– Use any flavor you like and just swirl a few teaspoons of it with a butter knife or toothpick all over the top of the yogurt. Remove excess liquid. When you are making yogurt bark with fruit, make sure to use paper towels to absorb excess fruit juices. Berries that have been washed should be patted dry. Barks must be frozen. I tried making a yogurt bark (not frozen) with gelatin but it had a weird texture and I don’t recommend it. Use full fat yogurt. Whether you are using regular yogurt or Greek yogurt, make sure to use full fat version for maximum creaminess. Adjust quantities. Use more or less honey, berries, nuts, protein powders, based on your preference. Frozen fruits vs. Fresh fruits. Either can be used since the bark is kept frozen. I used Vital Proteins Dark Chocolate Blackberry Collagen Peptides and Vital Proteins Banana Cinnamon Vanilla Collagen Whey in these barks. 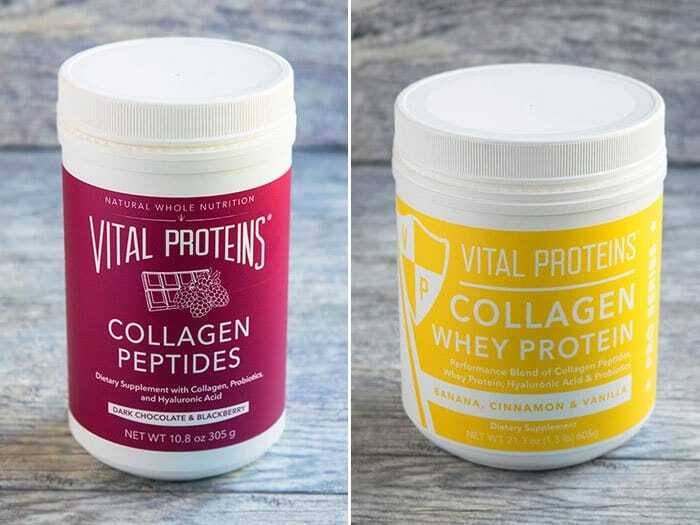 You guys already know how much I LOVE Vital Proteins products and both of these flavors are currently my obsession, especially that blackberry chocolate one… OMG! So good. It’s an AWESOME way to add more flavor and nutrition. They are gluten-free and there are NO artificial sweeteners and they are loaded with nutrients that are so good for your health. Check out all of my Vital Proteins dessert recipes for more ways to use these protein powders. I love this idea! Totally gives me a new snack option for the kids and their bottomless stomachs! hahahah! Get them to help you out… they will have so much fun! This would be a great treat to bring to the kids’ end of year party! I’m sure it’ll be a hit! Oh totally! Try different toppings… I think sprinkles would be a fun touch for the kids. What a great snack or dessert!